Enthalpies of complexation of diglycine (HL±) with Pr3+ and Sm3+ ions at 303.15 K and I = 0.5 (KNO3) have been determined by means of calorimetry. The thermodynamic parameters of the formation of diglycine complexes with Pr3+ and Sm3+ ions have been calculated at different molar ratios between metal and the ligand. Russian Text © A.I. Lytkin, V.V. Chernikov, O.N. Krutova, D.K. 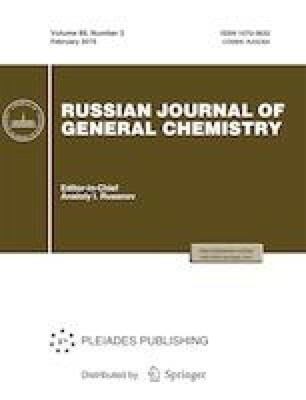 Smirnova, A.A. Golubev, 2019, published in Zhurnal Obshchei Khimii, 2019, Vol. 89, No. 2, pp. 254–257.